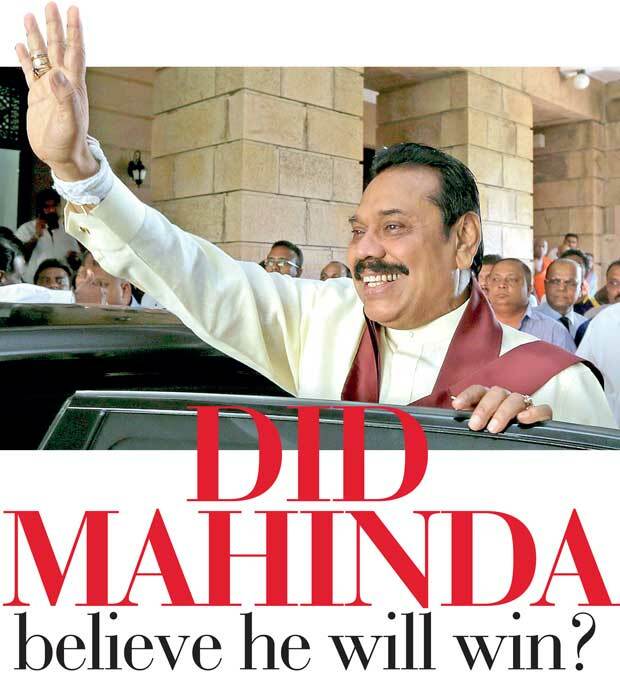 Daily Mirror - Did Mahinda believe he will win? Did Mahinda believe he will win? Yes, he did. It was not only a hope or wish. It was a strong conviction and belief that he would win and win convincingly. He was a hardened “street-smart“ politician with over 45 years of experience in politics. He had held office (power) since 1970 first as one of the youngest ever parliamentarians, then from 1994 onwards as a Minister and then as Prime Minister and from 2005 as President. He knew and could not think of any other life. Also he was battle-scarred after two successful Presidential elections in 2005 and 2010. In the 2015 campaign, after the initial thunderbolt of realizing that it was his lieutenant, Maithripala Sirisena and not Ranil Wickremesinghe that he had to fight, he recovered from obvious mental depression and got into the fray cheered on by gigantic crowds at each rally. His “campaign staff” soon took over. Then they did something grievously wrong. They created an euphoria of victory. They also had more than enough money to spend and the facilities of the print and electronic media of the state sector to use and abuse with impunity. Not even the Elections Commissioner or Court orders could stop him. Without looking at the statistical reality of the vote by the Tamils (TNA), the Muslims and the upcountry Indian Estate population (even without Thondaman), Mahinda‘s strategists made up their own minds that the President would win. They entertained no other views and could see, hear or speak of nothing else but certain victory. "Two days before the elections and on Election Day, this columnist spoke to four of such heavyweights and asked them what they thought of the would-be outcome of the vote"
These campaign pundits brushed away and devalued the Tamil vote by saying that the Tamils would not vote in their numbers and many would also stay away from polling because neither the candidate nor the cause was theirs. The strategists did not sit down and clearly study the TNA vote in each of the Northern and Eastern electorates and also in other areas like Colombo and Kandy where Tamil voters lived. The TNA vote was a silent but sure vote. Little did they know that Mr. Chandrahasan, a lawyer by profession and the younger son of the famous Tamil leader, the late Mr. S.J.V. Chelvanayagam had come to Sri Lanka from India and was campaigning in Jaffna to make sure of the Tamil vote for Maithripala. As regards the Muslim votes (which eventually swept like a Tsunami for Maithripala) Mahinda’s strategists argued that not All Muslims would vote against Mahinda. They took the view that the mainstream Muslims were shrewd businessmen and they appreciated the stability of the Rajapaksa regime compared to an unstable regime that the Opposition could offer. Also, that the Muslims highly valued a recent programme whereby the Sri Lanka Broadcasting Corporation (SLBC) had enabled Muslim Moulavis to broadcast their daily prayers Island-wide– a practice which had been stopped by a Supreme Court judgment of former Chief Justice Sarath Silva. These same President’s strategists at SLBC argued that this gesture alone which the President had permitted, would sway Muslim votes in Mahinda’s favour. As regards the Indian Estate Workers of the Nuwara Eliya and Badulla districts, Mahinda’s strategists had placed all their bets on Thondaman’s Ceylon Workers Congress (CWC) to deliver considerablevotes for the Betel Leaf. "Without question, the TV and newspaper advertisements of the Rajapaksa campaign were excellent. Both in volume and quality they scored over the Opposition that had fewer advertisements due to their meager financial resources"
Apart from showing excellent TV advertisements on development (mainly highways and urban development), Mahinda’s campaign team concentrated on spreading a fear psychosis among the Sinhala Buddhists (the majority of the voters) that the TNA and Muslim alignment with Maithripala Sirisena would weaken and eventually destroy the country’s unitary state. The TNA, they said, was the LTTE or the Tigers in disguise and now the Muslims were also demanding separate Administrative districts. The Tamil Diaspora and International conspiracies led by the United States were truly behind Maithripala’s campaign. This was the main plank on which Mahinda’s strategists walked. They argued that while the 2010 election was won because of gratitude to the President for winning the war, the 2015 election could be won by creating a fear psychosis of a return to conflict. According to Mahinda’s campaign team, the morning till night coverage from state-controlled TV – Rupavahini and ITN supplemented by the private TV stations – Swarnavahini and Derana – was winning the hearts and minds of the majority of Sinhala/Buddhist voters. Without question, the TV and newspaper advertisements of the Rajapaksa campaign were excellent. Both in volume and quality they scored over the Opposition that had fewer advertisements due to their meager financial resources. Two days before the elections and on Election Day, this columnist spoke to four heavyweights and asked them what they thought of the would-be outcome of the vote. All four were adamant that Mahinda would win. Two days before the poll they said he would win by 56% to 44%. On Election Day they had not changed their views about victory but had lowered the winning percentage to 53% to 47%. This columnist told them that the Maithripala camp was also confident of winning and were talking of a 56% win and so were the majority of the published surveys. However, Mahinda’s strategists would not accept any contrary view other than a sure win. One of those strategists this columnist spoke to, was a well-known person who writes a Political Column to a Sunday paper. The other was the head of a state-owned electronic media institution. The third was a diplomat recalled by the government for election work and the fourth was a very senior officer in the President’s Media Unit.What was amazing was that all of them were convinced of victory and were feeding this same view to Mahinda Rajapaksa. There was no one in his close group or groups that dared to differ or offer another viewpoint. This columnist can vouch that what happened to Mahinda Rajapaksa on this occasion did not happen to either President J.R. Jayewardene or President Ranasinghe Premadasa. Their governments also contested elections. They also had strategists and confidants. But those strategists did not “feed” their bosses only with victory stories or say it was a sure win. Also, both Jayewardene and Premadasa had enough political experience and acumen to siphon off doubts from the truth and look elsewhere as well for the real ground situation. For instance, J.R. Jayewardene used to get several experts to do the same survey without disclosing that he had employed others. At this election Rajapaksa was “lulled” to believe that he was winning and that he could not lose. From the accounts now available to the media, it is reliably understood that Mahinda Rajapaksa, who had returned from Beliatta after casting his vote that morning, had gone to the Operations Room at Temple Trees at about 7.00 p.m. in the night of the election day. At about 9. p.m. he had retired for a short nap but when he returned to the Operations Room (Ops Room) at about 10.00 p.m. he had learnt to his dismay – for the first time of the campaign – that the postal vote and votes in some of the electorates were more in favour of Maithripala. The Presidential network always enables early results to be given by mobile phones from the Counting Centres to Temple Trees. By twelve midnight Mahinda knew that the game was up and that the battle will be lost. Thus, in this columnist’s view President Rajapaksa was completely misled by his campaign people and not told of the true effect at least of the statistical analysis of the Tamil and Muslim votes in the North and East and Indian Estate Workers’ votes in the upcountry districts. The Tamil and Muslim votes also had a serious impact on enlarging the votes in favour of Maithripala in the Colombo District. The Colombo District votes for Mahinda were so much lower than those he received in 2010. Nor did Mahinda’s campaign staff apprise him of the true effect of the harm done by the Bodhu BalaSena (BBS) to the hearts and minds of the Muslims. Even if the Muslim leaders had stuck with Mahinda, the rank and file would not have voted for him. To the Muslims, because of the atrocities committed by the BBS in the Aluthgama region which led to the deaths of Muslims and serious property damage to their shops and homes, Mahinda was considered Haram. Among the Muslims the perception was (and still is) that the BBS was created by Gotabhaya, the President’s powerful brother. It was about that time when it was clear that Maithripala Sirisena was winning that Mahinda Rajapaksa is said to have thought of a coup to avoid the election result. However, this plan had not succeeded because it had been rejected by the Police and Army Chiefs who had been summoned to Temple Trees together with the Attorney-General. All these officials had warned against any such step. This resulted in the President requesting a meeting with Mr. Ranil Wickremesinghe and then finally departing Temple trees “peacefully” after farewells to his staff. The attempted coup story is yet to untold but what is certain is that President Mahinda Rajapaksa did truly believe that he will win the election until about 12 midnight on the election night itself !